Merry Christmas! Tuesday features a five-game slate starting at 12 p.m. ET. Both FanDuel and DraftKings are offering massive guaranteed prize pool tournaments for the Christmas slate, so today’s breakdown will be a little more detailed than usual. If you’re looking for even more Christmas coverage, make sure to check out the Action Network Betting and DFS Spectacular featuring Bryan Mears, Peter Jennings and Justin Phan. The Bucks own the second-highest implied team total on the slate, which is not surprising considering their matchup. The Knicks rank just 29th in defensive efficiency, allowing 111.9 points per 100 possessions. The Bucks have played at the sixth-fastest pace this season, so that should mean a lot of possessions against a really porous defense. The only real concern with Milwaukee is the point spread. They’re the largest favorites of the day, so this game definitely carries some blowout risk. Giannis Antetokounmpo is one of the best players in basketball, but that hasn’t translated into fantasy success recently. He’s posted an average Plus/Minus of -4.89 over his past 10 games on DraftKings, while his per-minute production has decreased to 1.54 DraftKings points over the past month. He’s averaged just 33.8 minutes per game this season and is currently projected for just 33.5 in our NBA Models, so his per-minute productivity is really important. That said, his DraftKings salary has decreased by $900 over the past month, and his current $10,700 price tag comes with a Bargain Rating of 95%. Giannis has also destroyed the Knicks over the past three seasons, averaging a Plus/Minus of +5.35 and a Consistency Rating of 71.4% (per the Trends tool). Khris Middleton is another member of the Bucks who looks like a nice value on DraftKings. He’s seen a price decrease of $1,000 over the past month, and his current $6,500 salary comes with a Bargain Rating of 98%. He’s averaged 36.3 DraftKings points over his past four games, and that kind of production would make him an excellent value at his current salary. Value options are pretty thin on the Christmas slate, which could make Brook Lopez an interesting option on DraftKings. He’s averaged 0.90 DraftKings points per minute over the past month, and his Opponent Plus/Minus of +2.36 is the top mark on the Bucks. Eric Bledsoe and Malcolm Brogdon round out the Bucks’ starting lineup. Bledsoe is the more expensive option and typically plays a few more minutes, but Brogdon has averaged more fantasy points per minute over the past month. If you’re looking for a low-owned punt play for tournaments, consider D.J. Wilson. He’s taken on a more prominent role in the rotation recently, playing at least 24 minutes in three of his past four games, and he’s averaged 0.85 DraftKings points per minute over the past month. He could also see a few additional minutes if this game turns into a blowout. The majority of the value with the Knicks comes from their frontcourt. Rookie forward Kevin Knox has taken on a much larger role recently, resulting in an average Plus/Minus of +6.66 over his past 10 games on DraftKings. He doesn’t provide much value in terms of peripheral statistics, but he’s cheap enough where he can return value on the back of his scoring ability. The emergence of Knox has done little to dampen the value of Noah Vonleh. He’s posted a positive Plus/Minus in four of his past five games and has averaged 0.96 DraftKings points per minute this season. He’s one of the best values at the PF position on DraftKings, where his $5,200 salary comes with a Bargain Rating of 99%. Enes Kanter’s playing time has been more volatile than his teammates’, but he has the ability to fill up the stat sheet quickly. He’s averaged 1.17 FanDuel points per minute this season, and his salary has decreased by $1,400 over the past month. He could be an interesting buy-low target. The Knicks backcourt could also provide some value on FanDuel. Emmanuel Mudiay has grabbed the PG position by the horns recently, playing at least 30 minutes in each of his past six games. He’s also posted a usage rate of at least 28.3% in four of those contests and leads the team with 10 Pro Trends. He’s an excellent value on FanDuel, where his $6,400 salary comes with a Bargain Rating of 95%. Last but not least is Tim Hardaway Jr., who has been the Knicks’ biggest constant for most of the season. He’s the only member of the team averaging more than 27.3 minutes per game, but he has seen a decrease in fantasy production over the past month. Russell Westbrook is in the midst of an odd season. He’s on pace for the lowest usage rate since his second season as a pro, and it’s been even lower recently: He’s posted a usage rate of 29.4% or less in nine of his past 10 games. That mark puts him barely inside the top 20 in the league and is a far cry from his 41.7% usage rate during his MVP season. He’s been able to make up for it by piling up triple-doubles – he’s averaging a triple-double for the third consecutive year – but he just doesn’t seem to offer the same ceiling that he has in the past. He’s in an interesting spot vs. the Rockets. On one hand, the Rockets have played at the third-slowest pace this season, and the Thunder’s implied team total of 109.75 does represent a slight decrease compared to their regular season average (112.0). On the other hand, Westbrook has historically done some of his best work against the Rockets, averaging a Plus/Minus of +6.87 on DraftKings over the past four seasons. He’s also priced at just $10,300, which is significantly cheaper than he’s been in previous seasons. 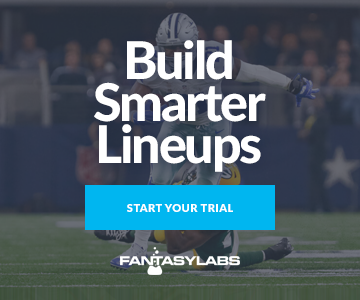 He likely won’t carry the same ownership as some of the top studs on the slate, which increases his appeal for guaranteed prize pools (GPPs). We’ve reached a point where Paul George is almost more expensive than Westbrook. He’s been an absolute monster over his past 10 games, posting an average Plus/Minus of +13.22 on DraftKings, and his salary has risen to $9,700 as a result. He’s increased his fantasy production to 1.52 DraftKings points per minute over the past month, which is the fourth-highest mark on a slate loaded with superstars. The Thunder could also be an interesting source of value. Jerami Grant has scored at least 27.25 DraftKings points in four of his past five games, which is excellent production considering his $4,500 salary. Dennis Schroder has seen a massive $1,100 price decrease over the past month, which could make him an appealing buy-low target. His role as the sixth man means he doesn’t play a ton of minutes, but his high usage rate does give him upside. Nerlens Noel has the smallest role among the value options but has averaged 1.15 DraftKings points per minute. He leads the team with an Opponent Plus/Minus of +2.25, and the lack of viable center options could make him an appealing target at the absolute minimum on FanDuel. Of course, you could also go with starting center Steven Adams, who benefits from the same plus matchup. He’s coming off his worst game in a month but was limited to just 28 minutes. He should return to his normal workload today and has posted an average Plus/Minus of +2.96 over his past 10 games. The Rockets are in an interesting spot vs. the Thunder. They’ve been one of the best defensive teams in the league this season, ranking first in defensive efficiency, but they do play at the fourth-fastest pace. The Rockets are also shorthanded right now – only six players are projected for greater than 13.5 minutes – which makes them an appealing team to target. The majority of the fantasy value on the Rockets is coming from James Harden. He’s been on a usage tear over his past 17 games, posting an average usage rate of 39.2, which has led to an average of 1.69 DraftKings points per minute over the past month. He’s also playing all the minutes he can handle and is projected for a slate-high 41.5 on the Christmas slate. Eric Gordon also looks like a strong target. He’s struggled to shoot the ball this season, particularly from 3-point range, which has kept down his price tag and fantasy production. If his jump shot starts falling, he has the potential for a huge fantasy day. Clint Capela has one of the toughest individual matchups on the team, but his $7,400 salary on DraftKings comes with a Bargain Rating of 99%. He’s increased his fantasy production to 1.23 fantasy points per minute over the past month. P.J. Tucker, Gerald Green and Danuel House could all be worth considering as value options. Tucker is the safest bet in terms of minutes but has averaged just 0.67 DraftKings points per minute over the past month. Green and House are more volatile options, but both have cheaper price tags. They could be worth using as punt plays for GPPs. The 76ers are one of the few teams with an injury situation worth monitoring heading into the Christmas slate. Wilson Chandler missed their last game with a quad injury, and his absence would open up some much-needed value. Mike Muscala replaced him in the starting lineup but was ultimately limited to just 17.5 minutes because of foul trouble. He was playing that much when coming off the bench, so he definitely has the potential for more minutes vs. the Celtics. He’s posted an average Plus/Minus of +6.04 over his past 10 games on DraftKings and has averaged 0.90 DraftKings points per minute over the past month. Joel Embiid headlines a pretty weak center position on Christmas, but his production has been way down recently. He’s averaged just 1.46 FanDuel points per minute over the past month, resulting in an average Plus/Minus of -5.58 over his past 10 games. If you exclude the two games he played with Jimmy Butler out of the lineup, Embiid has failed to return value in eight of his past 10 games. It’s possible he’s still overpriced in a difficult matchup vs. the Celtics. Speaking of Butler, he’s seen a sizable price decrease over the past month on both FanDuel and DraftKings. That said, he’s played limited minutes in blowouts over his past four games, and his $7,000 salary on DraftKings comes with a Bargain Rating of 95%. Ben Simmons leads the team with 11 Pro Trends on DraftKings, and his $8,400 salary comes with a Bargain Rating of 98%. He’s posted a 91% Consistency Rating over the past month, and he has one of the better individual matchups on the team as well. Unfortunately, his history vs. the Celtics is not good: He’s averaged just 36.78 DraftKings points in eight matchups. J.J. Redick relies on his jumper to score fantasy points, which does make him a little volatile for DFS purposes. That said, he does provide big upside on nights when his shot is falling. He has appeal for GPPs. That Celtics are basically back at full strength, with Al Horford, Marcus Morris and Jaylen Brown all rejoining the lineup in their most recent contest. That hurts them a bit in terms of value, but they can potentially make up for it with their matchup. The 76ers play at one of the faster paces in the league, which makes this a nice pace-up spot for the Boston players. Their resulting implied team total of 114.0 represents a solid increase compared to their season average (111.3). The Celtics offense runs primarily through Kyrie Irving, who has averaged 1.42 DraftKings points per minute over the past month. His salary did spike when the Celtics were shorthanded, but it has stabilized at $8,100 for the Christmas slate. It results in a Bargain Rating of 98%. The most valuable Celtic on FanDuel could actually be Daniel Theis. He’s benefited from the injury to Aron Baynes and is currently projected for 20.7 minutes in our NBA Models. He’s averaged 1.00 FanDuel point per minute over the past month, which makes him a nice value option at just $4,000. Outside of Irving and Theis, it’s hard to pinpoint which Celtics have the most appeal. They’re probably the deepest team in the league, and six players are currently projected for 22.5 to 29.2 minutes as a result. That doesn’t even include Terry Rozier, who could start for a lot of teams. That kind of depth makes them tough to handicap. Morris is probably the most appealing option of the bunch on FanDuel, where his Bargain Rating of 68% ranks third on the team. He’s also displayed the highest ceiling among the role players, going for at least 39.8 FanDuel points in two of his past five games. Gordon Hayward, Marcus Smart and Horford all deserve some consideration on DraftKings, where each has a Bargain Rating of 98%. Horford was limited to just 19 minutes in his first game back from injury but could see more in this contest to combat the size of Embiid. Hayward and Smart have both increased their per-minute fantasy production over the past month but will likely see a reduction in playing time with the team no longer shorthanded. This is the marquee matchup on Christmas, with LeBron James squaring off with the two-time defending champs. This marks the fourth straight year that King James will be playing the Warriors on Christmas Day, although the previous three meetings have obviously come as a member of the Cavaliers. The Lakers could potentially feature one of the top overall plays of the day. They could be without both JaVale McGee (doubtful) and Tyson Chandler (questionable), and their absences could result in a big role for Ivica Zubac. He’s scored at least 36.3 FanDuel points in back-to-back games, and his last performance was especially impressive considering it was vs. the Memphis Grizzlies. He may not be needed for as many minutes vs. the Warriors, but Zubac can do a lot of damage in limiting playing time given his average of 1.07 FanDuel points per minute. He’s priced at the dead minimum, which mitigates any concerns about the matchup. LeBron is an interesting option every time he’s on the slate, but his history with the Warriors isn’t exactly impressive. He’s averaged a Plus/Minus of -1.82 on DraftKings when facing them during the regular season, and that number drops to -4.65 when looking specifically at the three Christmas Day games. That said, LeBron’s $10,100 salary comes with a Bargain Rating of 99%, and he has scored at least 54.5 DraftKings points in four of his past five games. He seems underpriced, although his current price tag isn’t nearly as egregious as Harden’s. Brandon Ingram recently made his return from injury, and the Lakers wasted no time increasing his workload. He’s coming off 37.5 minutes in his most recent contest, and this game vs. the Warriors seems to suit his skill set. They could definitely choose to play small and turn this game into a track meet, which could result in a few extra minutes. Ingram’s return has had little effect on Kyle Kuzma, who has played 37 minutes in each of his past two games. He’s averaged 1.05 DraftKings points per minute over the past month, which gives him an appealing combination of playing time and production. He’s one of the top-rated PFs on FanDuel. Lonzo Ball had been a nice source of value, but the return of Rajon Rondo hurts him from a fantasy perspective. Neither player really figures to see enough minutes to be viable in this contest. Josh Hart rounds out their rotation, and he could have some appeal at his current salary. He’s not expected to play many minutes but did manage to score 22.75 DraftKings points in his most recent game. If this game does go small, he would likely be another one of the primary beneficiaries. I’m not going to waste too much time writing about the Warriors because we know what they are at this point. They lead the slate with an implied team total of 122.0 points in an excellent matchup: The Lakers are currently playing at the fourth-fastest pace in the league. Stephen Curry and Kevin Durant are obviously in play, and both look like excellent values on DraftKings given their Bargain Ratings of 93% and 98%, respectively. Durant in particular has seen a $1,600 price decrease over the past month, and his $9,300 salary makes him just the fourth-most expensive SF on the slate. Draymond Green deserves some added attention because of the position he plays. PF is probably the weakest position on the slate, and Green has been priced down considerably across the industry. His struggles as a shooter have limited his upside this season, but he has shot better from the field and 3-point range over his past two games. He has the ability to pile up peripheral statistics with the best of ‘em, so he has big upside if his shot is falling. Klay Thompson is coming off a poor game, scoring just 20.0 DraftKings points vs. the Clippers. That could result in slightly lower ownership on Christmas, which increases his appeal for guaranteed prize pools. He had scored at least 31.5 DraftKings points in six of his prior seven games. As far as value goes, you could look at Kevon Looney, Andre Iguodala and Jonas Jerebko. Iguodala is projected for the most minutes and is the cheapest of the bunch on FanDuel, but Looney and Jerebko have more upside given their superior per-minute production. The last game of the night is the least appealing for fantasy purposes. It has the lowest implied team total on the slate by a pretty significant margin, and the Blazers’ implied team total of 104.0 points is at least 4.5 points lower than every other team’s. That said, the Blazers could still provide some value on DraftKings. Damian Lillard owns a Bargain Rating of 99% and leads all guards with 12 Pro Trends. He’s priced as low as he’s been all season at just $7,800 and has historically posted a Plus/Minus of +3.56 on DraftKings. Jusuf Nurkic is an excellent producer on a per-minute basis, averaging 1.33 DraftKings points per minute this season. He also owns a Bargain Rating of 99% on DraftKings and could see a few additional minutes against a team that plays two traditional big men. The Jazz haven’t been nearly as effective against centers this season as they have been in the past, giving Nurkic an Opponent Plus/Minus of +1.93. C.J. McCollum has posted a Consistency Rating of 91% over the past month but has still seen a sizable price decrease across the industry over that time frame. He has upside and should carry minimal ownership. Al-Farouq Aminu and Evan Turner should see the most playing time after Portland’s Big 3. Aminu is the preferred target on DraftKings, where his $3,900 salary comes with a Bargain Rating of 95%, while Turner looks like the preferred target on FanDuel. He’s averaged more fantasy points per minute for the season and over the past month, and his $4,400 salary is slightly cheaper than Aminu’s. The Jazz got off to a rough start this season but have been better over their past three games. They’ve outscored their opponents by an average of 11.2 points per 100 possessions, and those contests have come against the Warriors, Blazers and Thunder. They rely on Donovan Mitchell for offense, and he’s also turned things around after a slow start. He’s posted a positive Plus/Minus in three of his past four games on FanDuel, which could make him an interesting option at $7,600. Ricky Rubio looks like a strong value on DraftKings, where his $5,400 salary comes with a Bargain Rating of 99%. His salary has decreased by $1,100 over the past month, but he’s scored at least 42.0 DraftKings points in each of his past two games. One of those games came against the Blazers, so he can obviously succeed in this matchup. Rudy Gobert is another member of the Jazz with a Bargain Rating of 99% on DraftKings. He’s averaged a stout 1.35 DraftKings points per minute over the past month, and he leads the team with nine Pro Trends. Joe Ingles has posted a positive Plus/Minus in three straight games, and his Opponent Plus/Minus of +1.30 on DraftKings gives him the top matchup on the team. He’s one of the few members of the Jazz who looks like a solid value on FanDuel. Derrick Favors, Jae Crowder and Kyle Korver round out the rotation. Favors owns a Bargain Rating of 98% on DraftKings and has averaged 1.07 DraftKings points per minute this season. Crowder is projected for the same amount of minutes and represents a solid savings on FanDuel, while Korver scored 29.5 DraftKings points in his most recent contest vs. the Blazers.